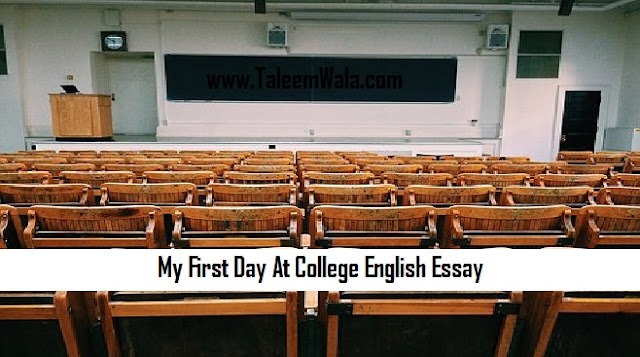 Here's a great paper and note for you on My First Day At College Essay in English with very easy wording for Inter, 2nd year or 12th classes and all of the English class students can now read this easy essay and then write on their papers or write in the exam. Download or read this essay and for reading it after a time you can bookmark this page by pressing Ctrl+D. Joining college after disciplined and restricted life of school seems a period of permanent happiness and freedom to every student. After I had got admission to a local college after the matriculation result, I was impatiently waiting for the first day to come when I could be able to attend the college. The life at college seemed a whiff of cool breeze after spending a tough life at school. The life at college seemed a period of permanent joy and freedom. On the first day when I entered the college gate, I was very nervous. I found many students in the same condition. The stories of the first year fool rang into my ears. I was stepping hesitantly towards the ‘main building of the college when a boy older than I offered me help. Since I wanted to take down my timetable, I asked him about the notice board. He told me to go to the left side of the building and then turn right. I thanked him and moved towards the guided direction. The moment I turned right I knew I had been fooled, the ‘bathroom sign’ fixed over the door made faces at me. I had not come out of my shock when a group of senior students came to me. One of the boys told that all first year students are to see the principal in the hail at once. They showed me the direction to the hail. Amid a crowd of boys with upset faces I reached the hail. I thanked God that this time I was safe. In the company of the first year boys I entered the hail and took a chair. The principal was a gray haired man. But what he said surprised us all. He advised us that we did not need to study. our stay at college was a period of stress free life.. While he was addressing us, an elderly person entered the hail. Seeing him the principal ran away, we all were very surprised. Then the elderly person came to the lectern and informed the boys that they had been be fooled by senior students. He then introduced himself as vice principal and welcomed the boys to the college. He then guided us to the notice board and told us how to find the classroom. Attending classes was an excellent experience. All the day long we kept on moving from one classroom t another. The teachers introduced us their subjects and recommended us the course books. The rest of the day was full of excitement. The friendly manner of the professors an excellent experience. When I got out of the college I knew I had a memorable day in my life.